Join us for your Zanzibar kitesurfing holiday and experience the best the island has to offer with the most experienced kite guide on the island. Kitesurfing prestine waters with great people always make your holiday that much better. Zanzibar is a “coastal sand bar island”, which means it is extremely flat with its highest point being only 120 meters above sea level. 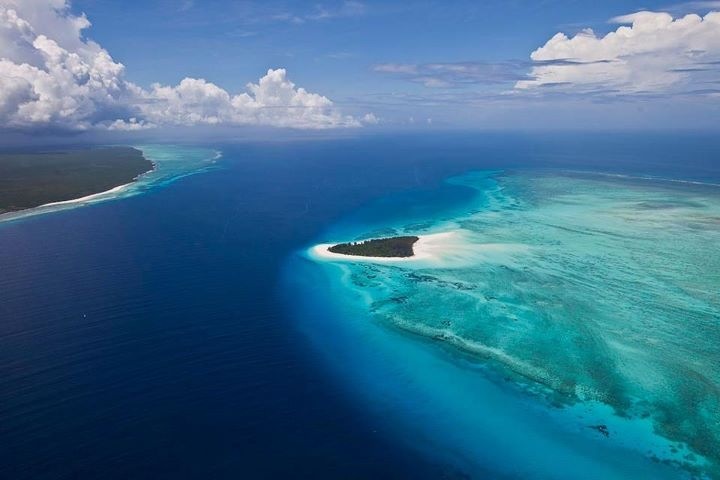 This also means the depth to distance ratio once in the water is very gradual, creating huge lagoons before the reef. Perfect for any kitesurfing lessons from beginner to advanced. 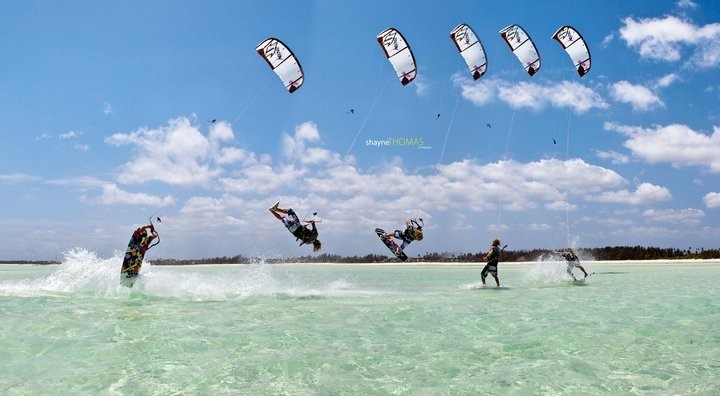 As a kitesurfing destination, Zanzibar has only really been on the map for around 4 years. It’s getting quite popular, especially Paje with around 100 people and a few other kite schools doing their kitesurfing lessons in the lagoons during peak season. The massive distances between the coastline and reef means that there will always be enough space for another kiter. Jambiani is a less crowded sandy spot which is great to kite. It has 2 big sandy areas that are stand-able until mid tide and a low tide lagoon that is a bit of a walk away and a great area to run kitesurf lessons over low tide. The coast line here is more rocky but the sand bar is perfect. Nevertheless our chosen spot to run beginner kitesurf lessons is in Paje, as the kite spot in Jambiani is a bit more tide dependent. But also here with an experienced kitesurfing coach, progressive lessons are guaranteed. We run our kitesurfing lessons mainly in Paje, but depending on the conditions and client needs we can relocate to various different beaches and go to the less crowded spots in Jambiani and around. Other kitesurfing spots in the north east have similar conditions like the south east but do have a few more sea weed farms and other hazards. The north east does have a beautiful island known as “Mnemba Island”. This island can be a great sight on one of the many downwinders organized. The west coast does not have many windy beaches but it does have sand islands for kiting. The coast line of Zanzibar is over 70 kms long with endless sandy beaches that are great for downwinder trips and can be designed to suit any level of kiter. The winds in Zanzibar average around 18 knots for the main kiting months like july, august and january. The best months to book your kitesurfing holiday camp start from july to mid september and can last till the end of october, and again in december up to the end of march. The winds tend to be quite consistent with it gradually building, then decreasing in strength over a week or so period. The ideal direction for the june to october season is from the south east or cross on shone and it tends to be around 20 knots . The december to march kiting season the winds come from the north and can be a touch gusty at times with some hoofing storms on occasion. Kitesurfing Zanzibar is truly an amazing experience. With the right knowledge and guiding, you can maximize your water time as well as get to explore this amazing african island. Join us on our kitecamp and get to kite the famous Zanzibar. To swing back to the overview of water sport activities, click here.